At the end of the 2017-2018 school year, Carrboro High School’’s beloved chorus teacher, Kay Johnson, retired. Johnson worked as the Chorus and Orchestra teacher at the school for 11 years, since 2007. Her retirement left two open positions in the music/art department. Carrboro hired Valerie Puhala to serve in the vacant chorus position. Puhala taught as a chorus teacher for four years at West Wilkes High School before coming to Carrboro High. In addition to teaching Chorus, she teaches one period of AVID. At Puhala’s last school, she was was one of the only music teachers for the day, so there was a lot more work for her. Here at Carrboro, the other music and arts teachers help her plan her concerts and other choral events. “I was excited about the closeness of the teachers in the arts department and the strength of the arts program as a whole,” said Puhala in an email interview about why she choose Carrboro High School for her job. Casey Spillman is in his second year as the CHS band director.. He worked as a band teacher for 12 years prior to being at CHS. He replaced Ms. Johnson as the orchestra director when she retired at the end of last year. “Once I knew it was okay with her, I checked to see could I get (basically inherit) the orchestra program. It was my request,” said Spillman. This is Spillman’s first year directing Orchestra, and he has never worked with string instruments as a director. But his love for classical music gave him the courage to give it a try. Spillman teaches two separate periods of Orchestra, one period of symphonic band, one period of Jazz Ensemble and a structured study period called “Study for Success.” In addition to all this, he directs the pep band for football games. For many teachers, this teaching load could be overwhelming. Students have enjoyed having Mr. Spillman as their new orchestra teacher. Those who have had other teachers noticed some differences between Ms. Johnson’s teaching and his. 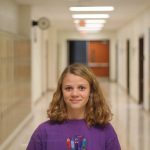 “He is very encouraging and I’m sure that under his instruction the Carrboro orchestra will continue to improve and expand,” said senior Anna Biglaiser over email, who has been in orchestra for 6 years (including middle school).